Anyone who knows me knows that I love potatoes, love with a passion that should be reserved for first born children and The Wife. I love them in any form and it has been bugging me that I can't make gnocchi. In fact I am keen to break out my pasta skills a bit more as I have an abundance of eggs at the moment, including the holy grail of pasta makers, duck eggs. I have the long skinny forms of fresh pasta down pat and was keen to get into some shapes. As per usual, twitter gave me some great responses, including one awesome page on a heap of different fresh pastas from @manusmenucom. As I was scrolling through and wiping drool off the iPad, I noticed the gnocchi. The recipe looked simple enough. I was determined to give it a go. Of course I didn't follow the recipe to the letter. I just used two potatoes, boiled and skinned and mashed with a fork. I stirred in a little fine flour and then the duck egg and kept adding flour until it achieved the correct consistency. 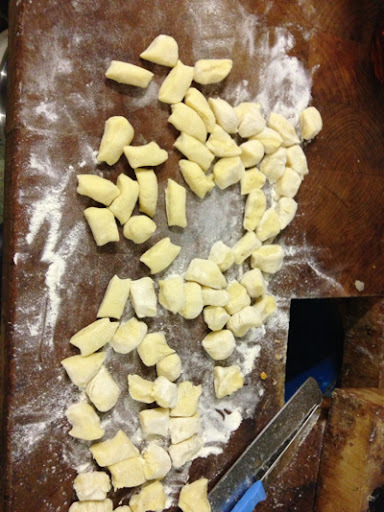 I failed miserably in using the fork to make little scroll shaped gnocchi, so I stuck to the pillows. I just made a really simple sauce of fried speck, onion, mushrooms, red wine and sugo simmered gently for a while. The gnocchi came out beautifully, soft and pillowy, the gnocchi of my dreams. On the weekend I will have a go at some shells, my love for potato is almost matched by that of fresh pasta and if they are all as successful as tonight I'll be a happy man. 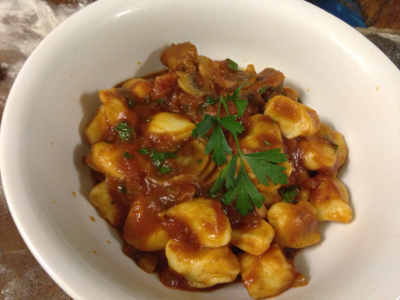 Oh my, I love good gnocchi and yours look delicious.